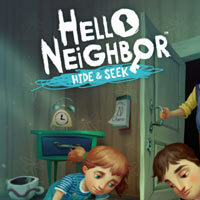 Adventure with elements of a sneaky with an action presented from the perspective of the first person, which is a prequeel of Hello Neighbor game published in 2017. Hello Neighbor: Hide and Seek is an adventure with elements of a sneaky, in which we play as children playing in a family home full of secrets. It is the work of an independent Dynamic Pixels studio, as well as a precursor to the previous developer's title, which was Hello Neighbor. This original production was released in 2017, after spending several years in the Early Access program on Steam. Heroes Hello Neighbor: Hide and Seek there are children of the antagonist of the first part of the series, whose carefree life ends when their mother dies in an unexpected accident. The story is intended to explain some of the threads that were presented in the previous game, but new players do not need to know the title. Hello Neighbor: Hide and Seek is a mix of adventure and sneaking, in which the action was presented from the perspective of the first person. During the adventure we explore fantastic locations that make up a bizarre house and hide from various threats. The production offers colourful three-dimensional graphic design, which was created in the comic style known from the original Hello Neighbor.